The Salzburg post is the last post of Europe '10. The next day, we went back to Munich, then flew to Dubai. Our flight from Dubai back to Malaysia was at 2 AM, I actually fell asleep. My dad had to start hitting me lol! I'd really like to actually visit Dubai one day. The things I've heard sound amazing, especially the pictures. Looks like an extremely modern city with uber awesome places. But Europe in 2010, was seriously an amazing trip. I never thought I'd be able to visit Europe until a few years time, and to just see those places, which you pretty much don't normally see on your first visit to Europe (Paris, London are those kind of stereotype places you go to on your first visit to Europe) and experience those countries which used to be part of Yugoslavia. I loved the balance of the scenery change in that trip, from the alps to the Dalmatian coast. Um well except for the cathedrals, I kind of got sick of them. My favourite country that I visited in Europe? Croatia! Dubrovnik and Split are such lovely coastal places. I would definitely recommend anyone who visits Croatia to at least go to Dubrovnik. The buildings and the colour are pretty vibrant, not to be missed! 5. I want to take lots of pictures. There's this photo competition I want to enter hehe. But really, I love travelling to anywhere in the world. It's just something I can see through my eyes and learn about the roots, the history and the beauty. The thing about travelling is that you usually experience the unexpected, see how a culture differentiates with yours and taste different flavours. Sometimes, you see things that really make you appreciate for what you have. So anyway, I may be just doing a bit of random posts like Japan, Thailand, Gold Coast. Not really a follow up, unlike Turkey, U.S.A and Europe. Expect a post about Thailand soon! 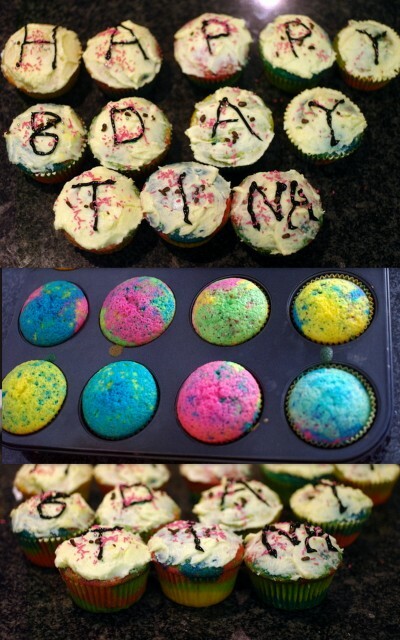 I also baked some cupcakes for my friend's birthday, Tina. She's my cute, tall and somehow eats like a pig, yet stays so skinny (high metabolism) Korean friend,and I decided to bake her rainbow cupcakes. Don't worry. It's not sickening sweet. It's just a vanilla cupcake with added colouring. And with cream cheese icing. The next time I make cupcakes, I want to use this piping flower tip my mum has which I think would look incredibly cool. Oh if only you could see the layers and explosions of colours when you ate the cupcakes... But I couldn't, since I brought them to school! I don't know what is with me, but I love baking for people. I love that feeling when you create something spectacular, or something so simple yet tasty, and it brings smiles. Put it this way, baking is like a science experiment. You have your different variables, your method, and even just one alteration can change the whole thing. Oh and did I ever mention that I love science?